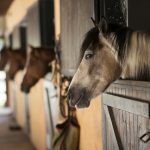 It is important during the winter for horse owners to take extra consideration in many aspects of their horses’ maintenance, including diet, hoof care, and especially management of facilities. Snow and ice can wreak havoc on a farm, but with proper care, catastrophic incidents can often be avoided. While the thought of injuries caused by slipping on ice or lacerations can be unsettling, there are multiple ways to help prevent problems. First, to inhibit slipping in an icy paddock, spread fresh manure in slick areas. If possible, do so when it’s a bit warmer or sunny. That way, when it freezes it will add traction to the ice. Sand can also be used, though a sand and salt mixture is not recommended due to possible ingestion. 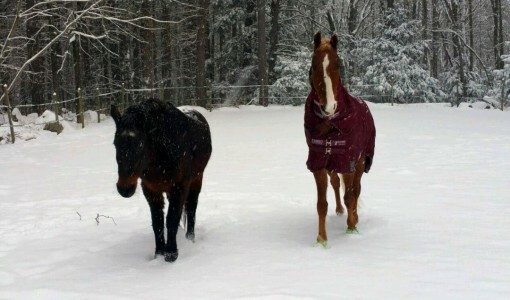 Bubble pads are one option to help keep ice and snow from building up in your horse’s hooves and shoes. Keeping your horse’s hooves clear of ice and snowballs will also reduce slippage, as well as strain on their tendons and ligaments. 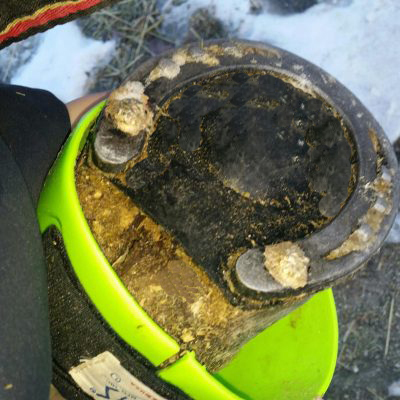 Bare feet provide better traction than shoes, but if your horse must be shod, it is a good idea to look into adding borium to shoes to help avoid slipping. Pads will also help prevent snowballs from building up. Having a conversation with your farrier before the winter season hits will allow you to best explore all of your options. Cordon off bodies of water—ponds, streams, etc.—regardless of depth. This will not only help prevent slipping, but also falling through thinner ice and getting nasty lacerations. Likewise, remove any icicles that you notice forming around your barn and paddocks, as a falling icicle can cause injury as well. 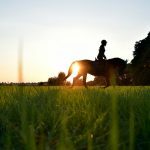 We all know, however, that accidents happen—especially with horses—and it’s best to be prepared for them. 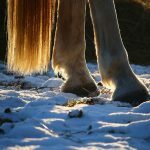 Should you find yourself in a situation where your horse has slipped and fallen on the ice, Dr. Kirstin Bubeck of the Hospital for Large Animals’ Equine Sports Medicine and Surgery Service suggests you first check for lameness by walking the horse for a few steps, and should any appear, call your veterinarian. “Another important aspect is to look for any injuries to the skin. 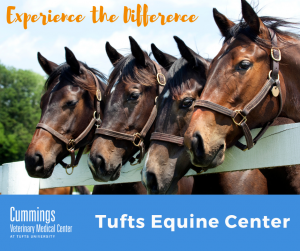 If your horse sustained only superficial skin abrasions without a complete break of the skin and no signs of lameness, you can clean the wound with chlorhexidine or Betadine scrub and saline solution,” says Dr. Bubeck. “This should be sufficient to reduce the chance of infection. You can apply an aluminum bandage spray to protect the wound after cleaning it as well. 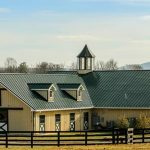 Winter can be long and often unpleasant to deal with when it comes to horses, but if you keep these tips for prevention and care in mind, you can breathe a little easier when it comes to ice maintenance.